It was a game of two halves for me last week service-wise. On Friday I had to renew my UK driver’s licence, and discovered I could do this using the new on-line renewal service just launched by the DVLA (the UK governmental department responsible for drivers’ licenses). Newspapers had reported that the system had crashed due to it being so popular, but on Friday all seemed well so I gave it a go. To be honest, the paperwork said I could renew my license only with a passport less than 5 year’s old. I kind of missed this bit and thought that I would be able to pay just the £20 fee on-line and then send the paperwork with a new photo through the post. I went on-line and as I had already registered to pay tax on-line, I could use these details to log me in. That worked. I was asked for my driver’s license number, no probs, my passport number, no probs, and my national insurance number as additional identification. All OK. I then paid by credit card and only at this point worried that I had misunderstood the fact that the on-line part was only for people with new passports, and not mine which is about 7 years old. So I phoned up, got through to a helpful lady who looked up my application, and she said no problem, this bit is now not relevant, and that on Monday, i.e. today, a new driver’s license will be in the post to me. I had thought I may need to post a new photo, but no. This system connects with the passport service system, and takes my electronic passport photo for use on my driver’s license. That is impressive, connected, and the whole process probably took around 10 minutes. Last week after some weeks of trying, I also finally gave up attemtping to open a bank account at one of Brazil’s top banks. I do not want to dwell too much on this as a bad experience, but I do have to say that the people I had contact with could not have been less concerned about me as a new customer if they had tried. If this was the level of service offered to people looking to open a new account, when banks supposedly go all out due to the lifetime value of a customer, then how will I be treated and what problems will I experience when it comes to actually using their service? It’s funny as the woman who was not helping me also willingly volunteered the information that it was not just me but another foreigner in that branch had also given up too trying to open an account due to the problems, and she said this without any recognition of the role she had played in these shenanigans. Crazy huh? This is not seeing. Unfortunately this is daily reality in Brazil, in which the notion of service is normally sadly lacking for many systemic and cultural reasons. I would though like to counter this observation with one extremely impressive example of service, which is Multicoisas, a national chain of shops selling general household products such as cables, stationary, kitchenware, things like that. 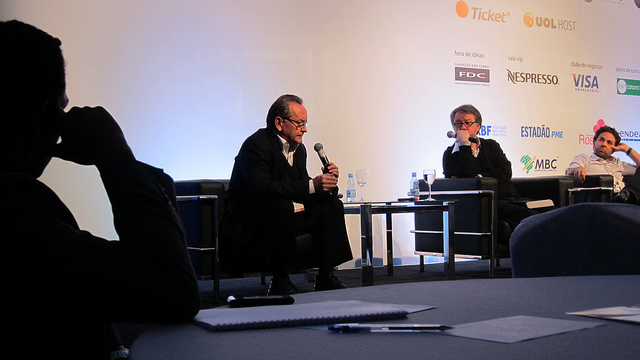 The President of Multicoisas is Lindolfo Martin, and I have written about him before when I had a chance to meet him at a summit for small and medium sized enterprises in São Paulo in 2012. Lindolfo talked about the role intuition played in his philosophy of leadership (something I will discuss later in this article) and so I spoke to him afterwards to find out more. Fornecer soluções às necessidades de reparos, acessórios e utilidades do cotidiano, buscando a excelência no atendimento aos clientes, através de pessoas qualificadas. The mission of Multicoisas is “To provide everyday solutions relating to repairs, accessories and utilities, striving for excellence in customer service via qualified people.” The Portuguese is more poetic, which you will see above. 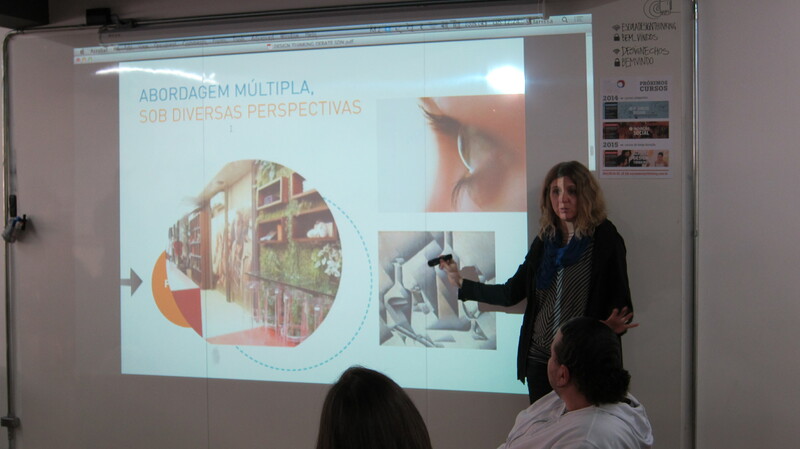 As I mentioned, Brazil has huge systemic cultural, educational and systemic problems, but Multicoisas have overcome these by ensuring that each and every member of their shop staff attend the Multicoisas university before starting work at a store. This is impressive and it shows. When you enter Multicoisas, staff are attentive but if you want to browse they leave you in peace, although should you then need to ask a question they are there for you and not checking Facebook on their phones for example. They are trained to sell you the right product. For example, a couple of weeks ago I needed a cable to hook up my laptop to my tv. I needed a little help and although was shown an expensive top of the range cable for 3D and HD, once the sales representative understood it was for streaming videos, ensured that I left with a good quality but much cheaper cable which is perfect. If the shop does not stock a product, sales staff are also trained to tell customers which other local shops in the vicinity may stock it. Maria and I also had an experience in another branch some months ago, when we bought some pans, but the computer system for loyalty points was not working. We returned some weeks later as we needed something else, and told the manager of that branch that we had lost out on points. Without any hesitation, he asked us what the cost had been, and we gave a guess as we could not quite remember the exact cost. he immediately put some extra points on the card, trusting us as clients that we were honest people not out to scam them. If I talk about this as an example, it shows what levels of service can be achieved in a country where corruption is systemic and where the majority of business thinking is still sadly myopic and short-term. If we are to become sustainable in business, we need to think about both people as well as the planet. We need to ensure that people are not sold more things than they need, but in doing so we will build trust, engagement and a long term relationship. And so we come to the main point of this article, which is Service Design. 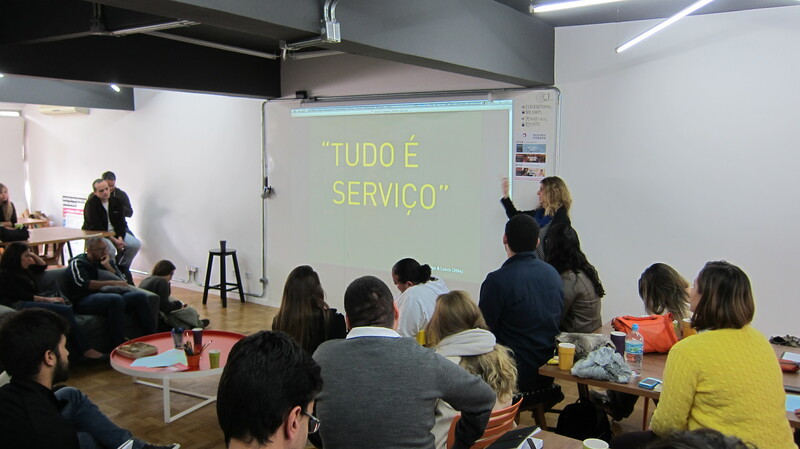 I had the great honour and privilege to be invited to speak about Holonomics at the 2014 Service Design talks in São Paulo, which also saw the launch of the book Isto É Design Thinking de Services, the Portuguese translation of This is Service Design Thinking. 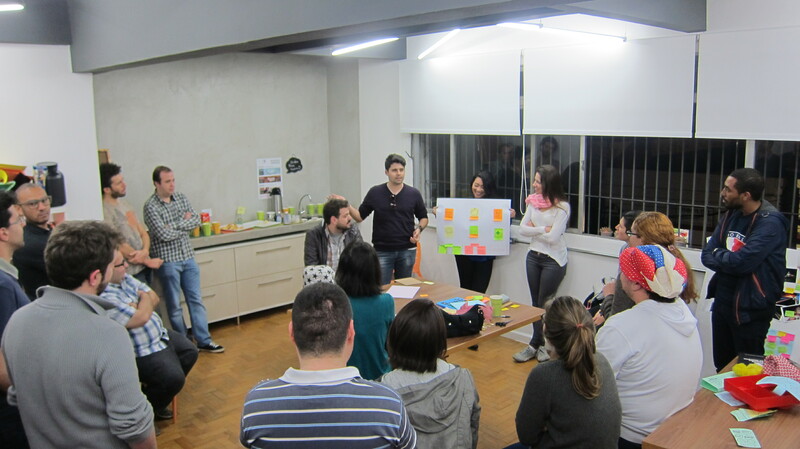 The preface to this edition was written by service designer Clarissa Biolchini, who was also responsible for the technical revision of the translation, and she had come to the talks to launch the book, present a lecture on service design, and then in the afternoon run a four hour workshop on Service design Thinking. 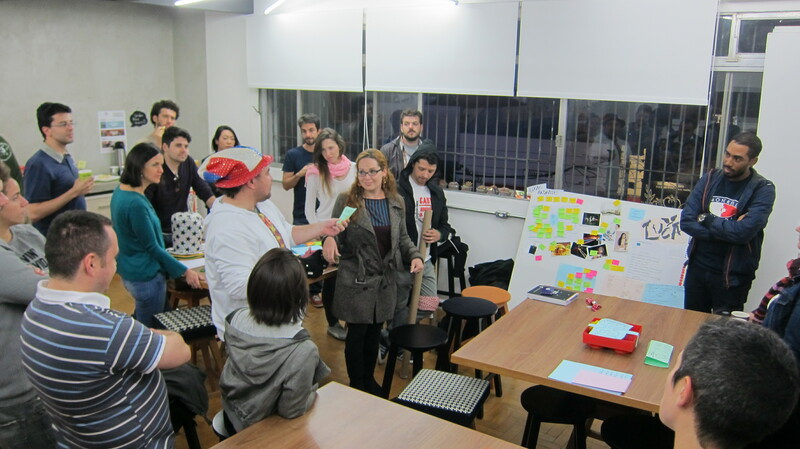 This is Service Design Thinking is an extremely excellent and comprehensive textbook on design thinking for services, and you may now see why I spent a little time opening this article about the current state of services in Brazil. 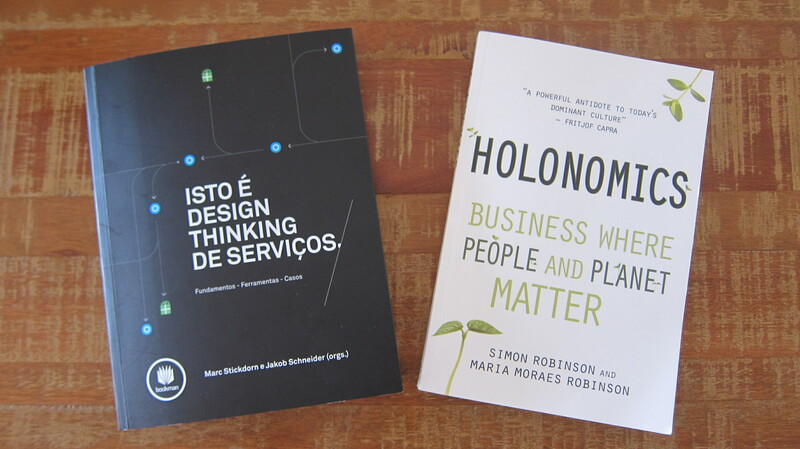 Many people from many parts of service organisations in Brazil absolutely need to read this book, which covers what is service design, which type of people are involved, the types of tools used in the service design process, and many real-world case studies from a wide range of contributing authors. 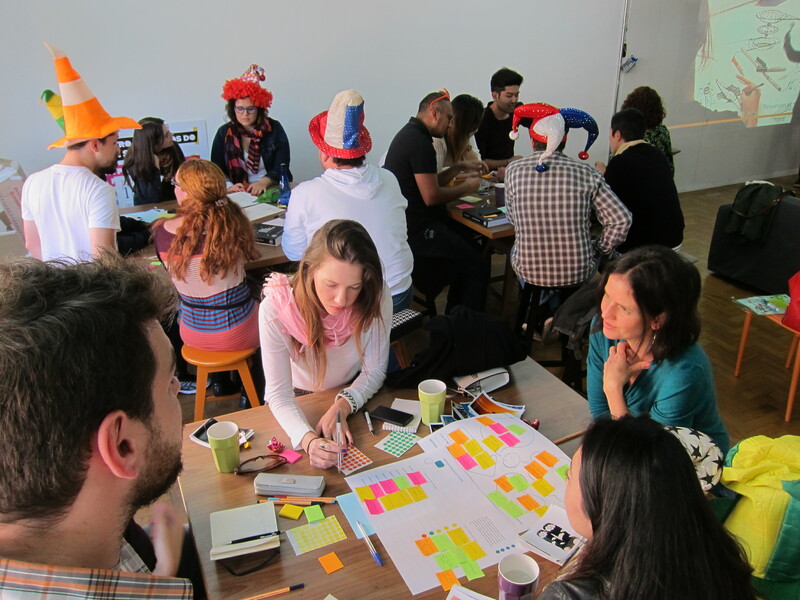 Service Design Network is actually an international not-for-profit organisation designed to help service designers all around the world network and learn from each other in order to raise the levels of standard of design of services. 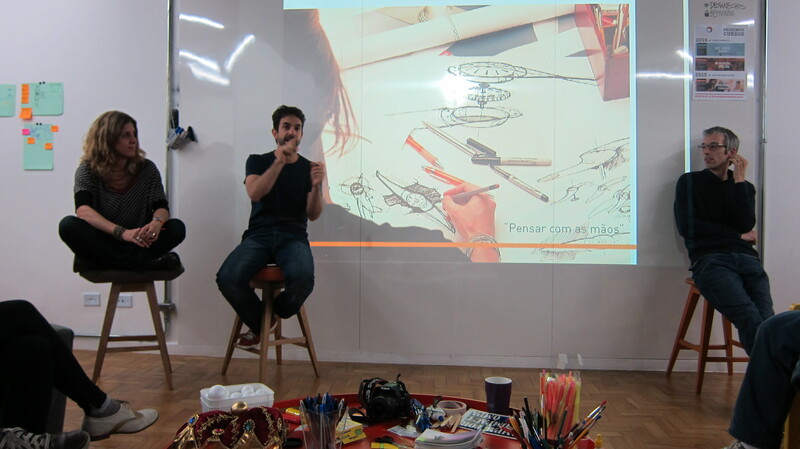 The Brazilian Service Design Network is organised by Érico Fileno, Hilton Menezes and Igor Saraiva, and this year the talks were hosted at Esola Design Thinking (The School of design Thinking) in São Paulo, with Marco Santoro, one of the co-ordinators at the school joining in. In the morning there were a series of talks on service design, the first one coming from the user experience team at Totvs (which in Latin means ‘everything’ and ‘all’). They discussed their facilities, how they work and some of the services they had worked on, sharing their experiences and insights. 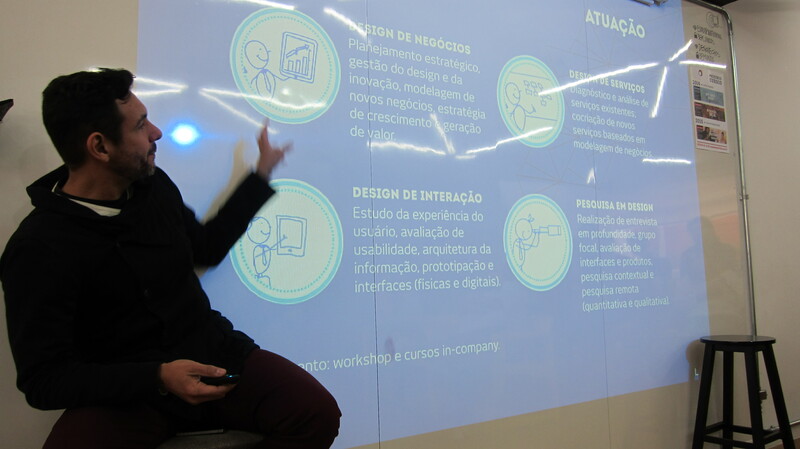 This talk was followed by a presentation from Hilton Menezes, from Welab, who also discussed certain aspects of the design thinking methodology in relation to service design. Hilton focussed on the customer journey, and for me mapping out the customer journey is a fundamental activity that many companies for some reason do not seem to do. 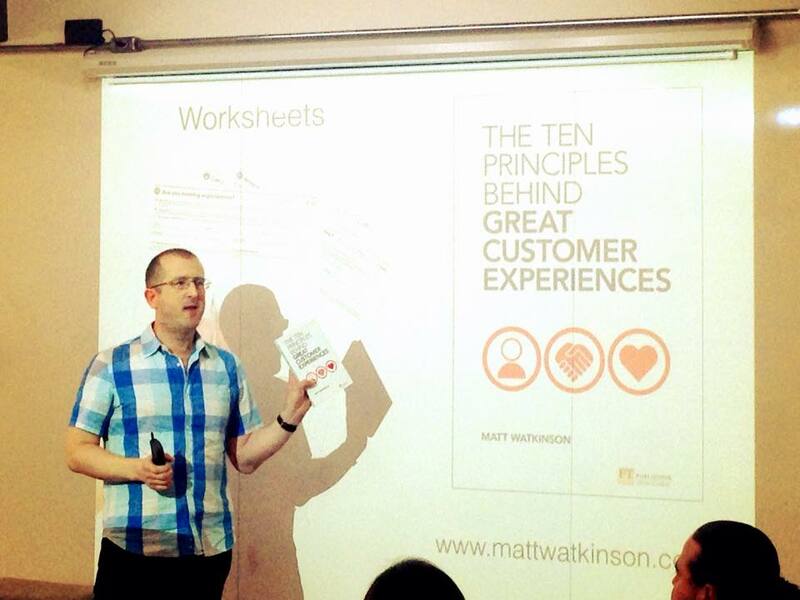 For me mapping the customer experience is not something which can be brainstormed. You have to really go out and observe the customer experience end-to-end. The problem is so many people in marketing have a mental model of their customer experience based on what they think the experience must be like, but so often the actual reality is very different, due to exectuives having lost direct contact and connection with customers. After another short presentation from Érico, I then went up to discuss Holonomics and the history of the smart phone. 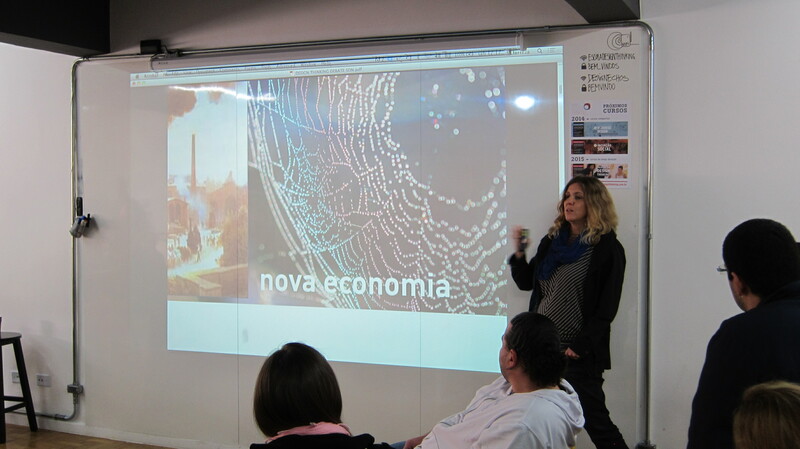 For a long time I have had a goal to start speaking in public in Portuguese, and although I am not yet fluent, this was my first public presentation in Portuguese, although for the more analytical complicated bits I did have to switch back to English. Much of my talk can be found in a previous article of mine A Brief (and Personal) History of Mobile Telephony 1992 – 2002. 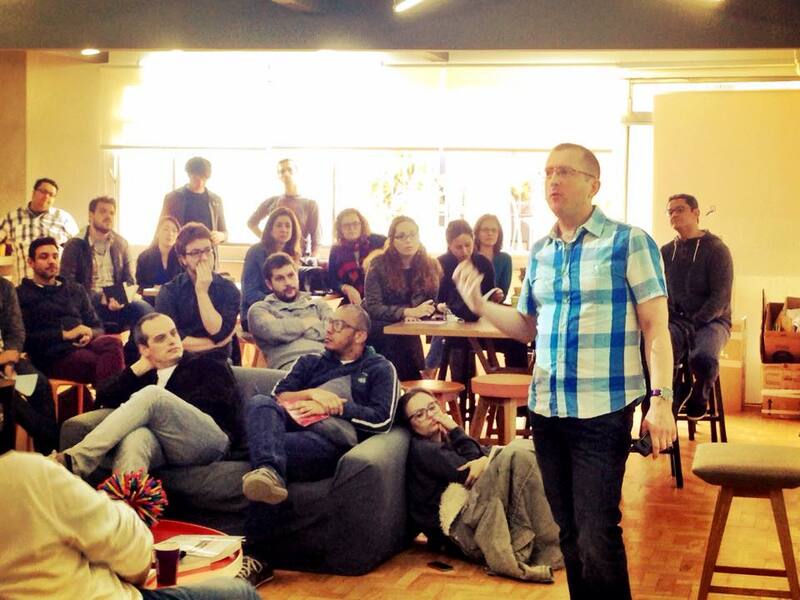 I started my talk with an overview of Holonomics and holonomic thinking, and how this relates to design thinking. The great theme of Holonomics is how we can gain an authentic understanding of what a system truly is, and to truly understand a system we need a dynamic way of seeing. Holonomics is not a methodology, it is not a tool, it is an expansion of consciousness, and hence I love to use my Hoberman sphere which people always enjoy, as a wonderful metaphorical visual aid to moving from mechanistic and fragmented vision, to seeing the whole, with all the interconnections. This is what the bank I had problems with is suffering from – fragmented thinking which fails not only to understand the service as a system – end-to-end – but it also fails to understand how it is a counterfeit system, with the essence, the brand, the purpose of the bank utterly failing to come to presence in each and every part. This is what Multicoisas does so well. I experience Multicoisas through each ‘part’, through each and every interaction with every single one of their team, not just through the way in which I was received and welcomed into a short discussion with the President who did not know who I was at the time and who also had limited time due to another pressing appointment, through the branch manager, and each sales person right through to the person at the cash register who is always friendly and helpful too. This is an authentic brand. This is a very difficult lesson companies seem to have learning, but it is what my own company Holonomics Education is helping organisations with here in Brazil. As I said in my talk, Drucker’s phrase “culture eats strategy for breakfast” is spot on, and unless the culture really has human values operating – love, peace, truth, right-action and non-violence – no matter how good the strategy is, not matter how good the design of the service is, without an outstanding culture there will always be a gap between strategy and its operational implementation. And this will cost businesses a huge amount of lost revenue, it will cause waste and will damage morale. Understand the end-to-end customer experience. Companies can’t see all the ways in which to observe their customers and collect data about services and the customer experience. To change the way leaders think, use their language. 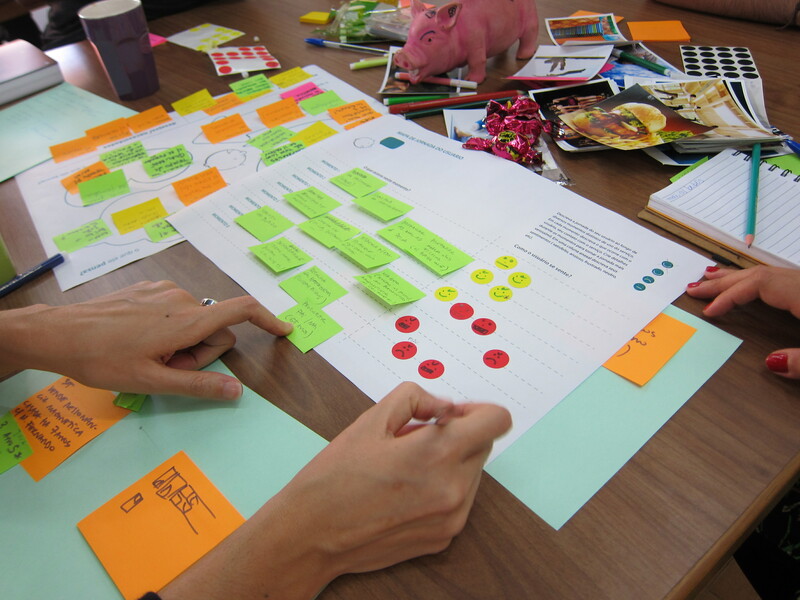 Use business cases to justify Service Design. Keep calm and learn how to receive feedback. You’ll be brilliant. Comprehend systems using all four ways of knowing – thinking, feeling, sensing and intuition. Expand your level of consciousness so that you can see the whole system. Understand the dynamics of seeing and the appearance of phenomena. It was quite amazing how the talks all seemed to really gel and flow into and out of each other. 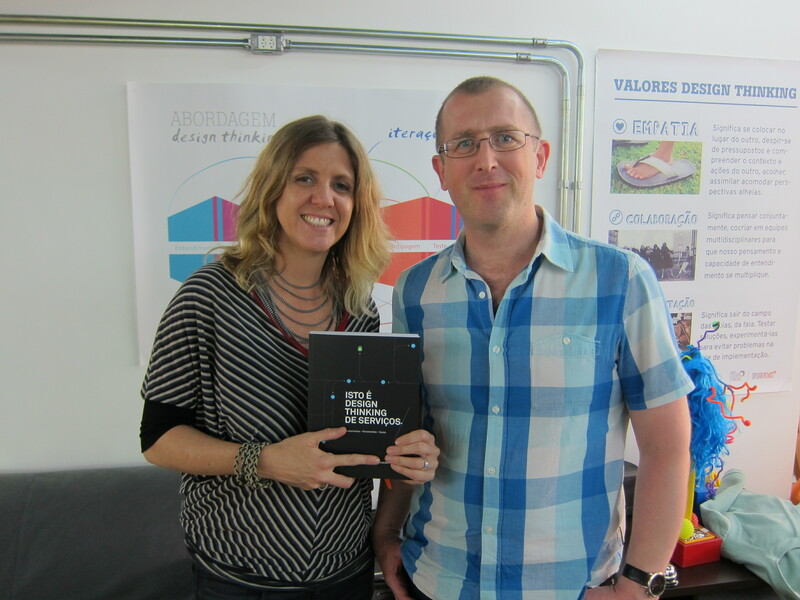 I was followed by Clarissa, who gave a presentation on the concept of Service Design Thinking. This was an excellent overview, and you could really see how Holonomics, with the expansion of consciousness which facilitates a deeper and wider vision and understanding of a system and phenomena, complements Service Design Thinking in a profound manner. We are now seeing an overall evolution in consciousness, as we move into a more collaborative, co-creative and sharing economy, a point also reflected in Clarissa’s talk. There are some profound changes happening in society, and it will be those organisations who do the deeply transformative work, using service design thinking, who will really be resilient, sustainable and innovative moving ahead in the coming years. People and planet – you have to have authentic relationships with both, just talking the talk is no longer sufficient. 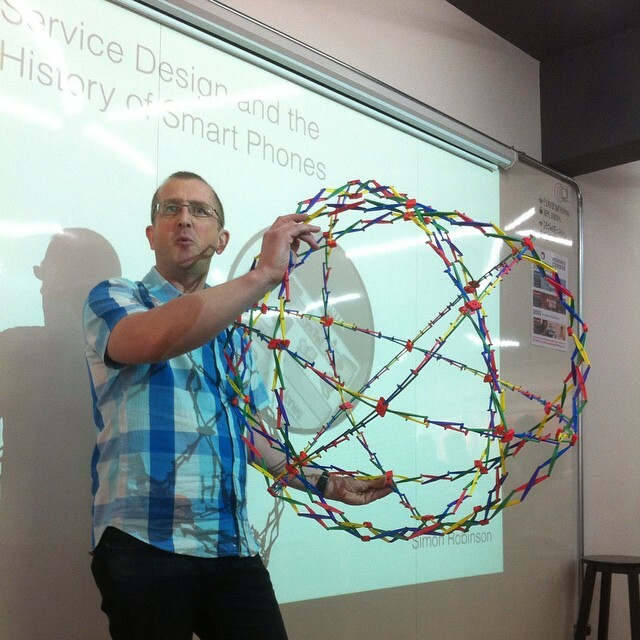 As I discuss in a recent article, if you have bad service design, your organisation is probable a knotwork and not a network (see my article Beware of Knotworks – Networks with Ego). In the afternoon Clarissa facilited a four-hour workshop introducing some of the tools and techniques of Service Design Thinking. This was a well attended, lively, creative and very entertaining workshop with everyone really entering into the spirit of the quest to conceive and develop better services. I thought I would share some of the photos from the day. Igor also shot this great video capturing the whole day. 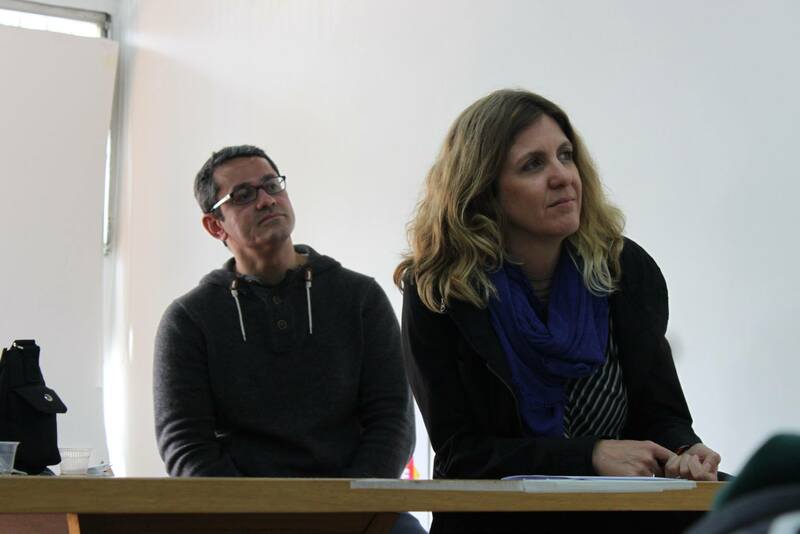 As Hilton and Érico said in their opening remarks, each and every person presenting on Saturday was volunteering their time and energy, sharing experiences, insights and tools and techniques with everyone there. 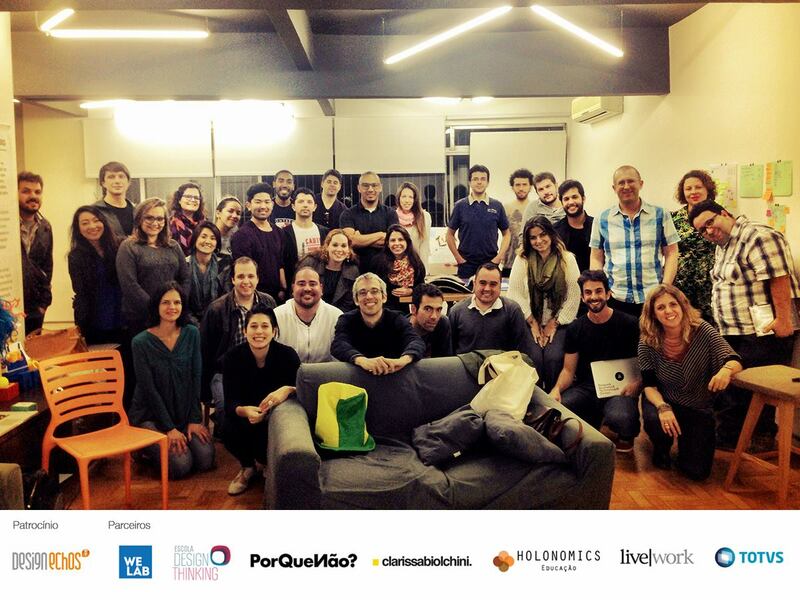 As you can see in the photo below, it was an amazing day with energetic participants all there with the goal of the deep desire to contribute to the development and transformation of Brazil. I was very proud that my own company Holonomics Education was a partner, along with the other companies all contributing to what was a very inspiring day. As I said when I ended my talk, I hope that this is the start of a greater conversation. Yes Brazil needs to improve, but you know what, in this photo you’ll see some of the great people here in Brazil who are getting on with it, despite the obstacles and frustrations of all of us who live here. 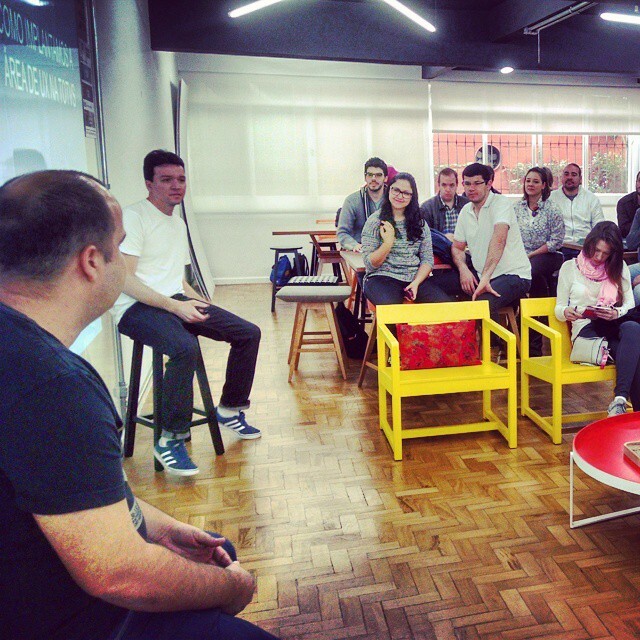 There is now a buzzing thriving design and start-up scene across the whole country, and through events like the Service Design Talks, as a collective we will get there. Definitely.